All runners have bad days. The most prominent factor that sets a champion apart from others is the ability to move forward after that run that didn’t go according to plan. Figuring out just how to bounce back! As many of you may have seen, last weekend at the Tobacco Road Marathon, I had my first DNF in 30 years. I had been battling an injury, caused by a rookie mistake and while I felt strong leading up to the race, I soon realized that this marathon was not going to go according to how I had hoped. 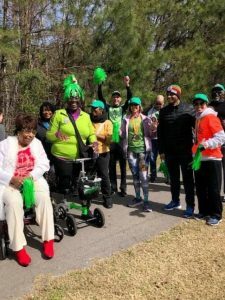 Luckily, it turned into an amazing time cheering with the local Raleigh, North Carolina Galloway group but, it can be difficult to bounce back when something like this happens. So, how do you bounce back? Spend a few minutes trying to learn what you may have done that brought on the problem and you will improve in many ways. A bad run will trigger negative messages, such as “You are losing it,” “Running isn’t fun anymore,” “You’ll never get to your goal,” “Why are you doing this?” If you focus on these and believe them, you will allow the reflex brain to create negative beliefs, stimulate negative peptides and lower your motivation. Here are some steps for turning your attitude in a positive direction.